Test out Splatoon 2 this weekend! One of the up and coming games on the Nintendo Switch is going to be Splatoon 2. The original Splatoon captivated everyone with its charm on Nintendo’s take on the first person shooter for the Wii U. I remember being able to play it on the big screen the year it was announced at E3 and it was really fun. At the time I don’t think anyone knew how to accept that Nintendo was going with a FPS like Splatoon and would succeed with it. Fast-forward to the Nintendo Switch era and we will be playing a new Splatoon soon. If that isn’t enough to tide you over, Nintendo is going to have a Global Test-fire for Splatoon 2 over the course of this weekend, March 24-26 2017. Nintendo is trying to make it as easy as possible for you to get into the Global Test-fire without pulling your hair out. Start out by downloading the demo version of the game from the eShop onto your Switch. 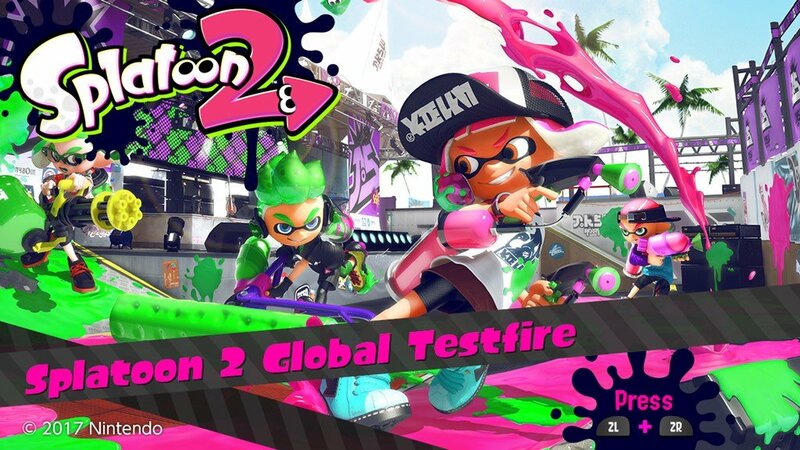 Nintendo will be having special times that you can jump on and be a part of the Global Test-fire, which will be listed at the end of this article. NOTE: Times will be in PACIFIC time! Welcome additions to the Switch Splatoon are Labs on the go; having a lab/action anywhere you can get Wi-Fi connection. This could be an issue for some, seeing the reports going around the Internet that the Switch Internet Wi-Fi signal reader has a tough time picking up the signal. You can also capture your Test-fire findings with the capture button on the Joy-Con or the Pro controller and share the captured material Facebook or Twitter.